Why would the Texas Medical Association “strongly oppose” legislation to stop patients from getting surprise bills? …And why I strongly oppose their opposition. Surprise billing from hospitals, in case you are unaware, is a common reason that smart, sensible and financially sound people in the United States go bankrupt. One example is John Stockman, who went to the Emergency Room in the middle of a heart attack. He left with a bill for a million dollars, despite having decent insurance. John Stockman is not alone. 54% of Americans say they received a medical bill in the last year for care they thought was covered by their health plan. A staggering 1 in 7 in-network hospital admissions results in a surprise bill. One year after I got a blood test from an in-network doctor, I get this bill. 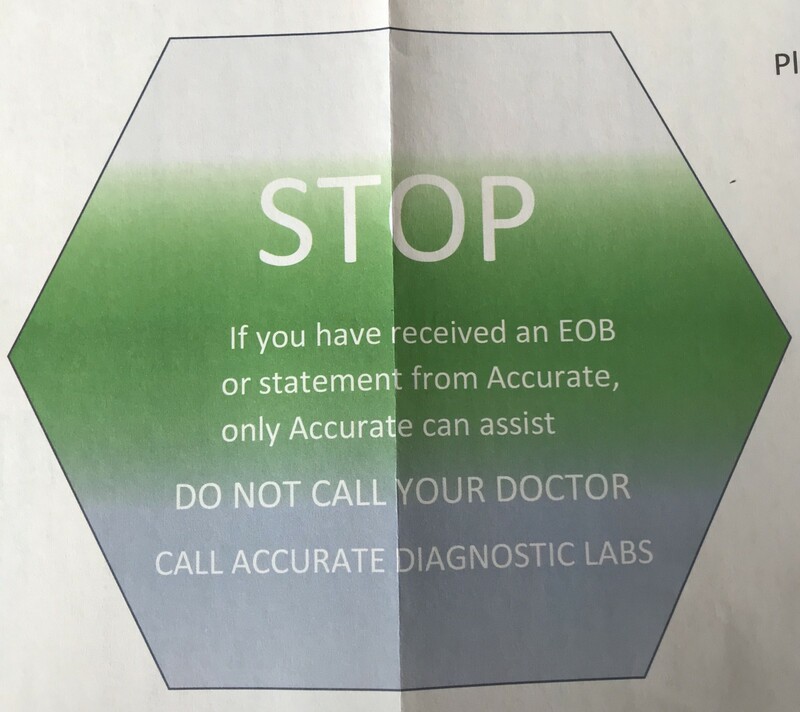 Notice from Accurate Diagnostic Labs to refrain from letting my doctor know I got a surprise bill a full year after services rendered. Who does this? But let me refrain from getting distracted by a mere $531 when someone in my office got a bill for over $2500 for services rendered during a “covered” colonoscopy. Despite going all the way to the state level to fight it, he still had to pay the full bill. Or this woman who went to ER after being bitten by a stray cat and got a bill for $48,000. Point is, anyone who thinks they are inured from surprise billing because they are too smart or sophisticated or has too good insurance could be woken up, (perhaps literally in a hospital bed) to a very costly surprise. I was under the mistaken impression that doctors, such as those who form the Texas Medical Association, would be all for removing surprise billing. Doctors know that “financial toxicity” is a well-proven reason why patients do not get care they need. People choose to have their heart attack at home or don’t seek medical care for their pneumonia because they fear the unknown sticker shock. Many doctors I know form an unwavering front line doing everything they can to help patients despite burn-out and long hours and a granite commitment to do no harm. Therein lies the conundrum. Given the harm it causes patients, what possible reason could the decision-makers at the Texas Medical Association have for “strongly opposing” a proposed law to eliminate surprise billing? Oh ok. I get it now. Some doctors choose to make a fortune off unsuspecting people. People who are incapacitated, or at least badly injured, and easy marks to get their savings accounts emptied out. Other companies, like one called EmCare have basically turned surprise billing into a business model. What can you do to combat surprise billing right now? Write Alex Azar, Secretary of the U.S. Department of Health and Human Services, who has pledged to eliminate surprise billing. Here’s his contact info. If you’re in Texas, write your congresspeople to support legislation introduced by Sen. Kelly Hancock, a Republican and Rep. Trey Martinez Fischer, a Democrat, that would treat all emergency room visits as in-network and bar doctors from billing patients for any portion of a charge that insurance does not pay. In addition it would protect unsuspecting patients who go to an in-network facility, such as a hospital or surgical center, and later discover they were treated by an out-of-network provider. If you’re not in Texas, write your state and federal congress people to eliminate surprise billing for the rest of us. There are currently bipartisan bills in congress right now by Sen. Bill Cassidy (R-La. ), a Democratic bill by Sen. Maggie Hassan (D-N.H.), and House versions by Reps. Lloyd Doggett (D-Texas) and Michelle Lujan Grisham (D-N.M.). Please join me in keeping an eye out for the actions the AHA takes relative to surprise billing. My greatest hope is that their work and lobbies are aligned with their words. This is a long battle between insurers and providers where, unfortunately, the patients are in the middle. Compounding this are physician groups (usually hospital based) and hospitals, in some cases that have blown through any reasonable fees, and have made the case for physicians problematic. The truth is that insurers low ball physicians, and have been doing that for years. Unless you are the only physician in a community with a particular specialty, or have a group the size of General Motors, you have very little bargaining power with the insurers. And they use every inch of their leverage to lower rates. That’s good for employers until the rates get to be below the cost of providing the care, which is where we are with some specialties now. Insurers have tied reimbursements to Medicare for many years now, and the travesty is that physicians have allowed that to happen. If you look at a chart of Medicare physician practice expenses since 2000, you can see that Medicare and ergo private insurance payments haven’t kept up with these expenses over a 15 year period. The insurers have been riding the Medicare beat down, even though the Medicare rates are politically and not economically driven. However, with that said, the TMA’s premise is that hospital based physicians (who are independently contracted with the hospitals) should not be “required” to surrender their bargaining power to a hospital that doesn’t have their best interests in mind. I agree with that wholeheartedly. No one wants to have someone else have the ability to set their fees for them. Certainly other professionals – i.e. lawyers (who make most of these laws) don’t have that requirement. Why would physicians be asked to do that? So, that’s not a solution. Unfortunately, we have a few outlier physician groups that have created the problem – most notably FSER’s – the scourge of the health care system. There are others, however. Some hospital based groups do this, and take a very aggressive approach to anyone who disputes the balance bill. Neonatologists (who don’t ordinarily come to mind when thinking of hospital based physician groups) in several of the hospitals do the same thing and charge wildly high fees – sometimes 800% above Medicare. Sounds like the same thing hospitals themselves do. While I agree with the TMA’s position, some of the physicians in the state have put them in a position where it’s hard to justify their position. I expressed that very opinion to the lobbyists and executive director of the TMA (who I know very well) that they should not tie themselves to the FSER’s, but it didn’t do any good. As I understand the legislation, it pretty much takes the patient out of the equation which is not going to be good for physicians in general as they don’t have the bargaining power to deal with insurers on their own. There are 5 BUCA’s and thousands of physicians. Who do you think has the bargaining power? Physicians as a group are pretty good at shooting themselves in the head. While this is a very complex issue, the fundamental problem is the lack of a truly free, rational market in medicine and healthcare. One of the consequences is the asymmetrically elevated political and economic power of the large 3rd party payors with respect to employers, physicians, other providers and, most importantly, patients. This is reflected in narrow networks and poor access to care. It is very difficult for most people to find a new primary care or specialist physician in most networks without a wait of several weeks to months. The networks are narrow because narrow networks limit utilization and costs while retaining tighter control, which is in the insurance companies’ quarterly financial interest. Because of the lack of in-network capacity, narrow networks create demand for out of network services which then result in balance bills. That said, there are rogue physician practices (many are corporate) who submit outrageous bills which make the rest of us look bad and provide political fodder for those who want the insurance companies to continue to control healthcare and practice medicine without training, licenses or liability (ERISA). If you’re interested, The Patient Institute (www.patientinstitute.org/healthpolicy), has a list of conditions and diseases of healthcare systems which are relevant to this discussion. Some of these include: incentive malalignment syndrome, hypermetricosis, benefit managementosis, maladaptive dysdocumentosis and more. Probably more than you wanted to hear but happy to continue this conversation. This entry was posted on Monday, April 8th, 2019 at 11:43 am and is filed under Uncategorized. You can follow any responses to this entry through the RSS 2.0 feed. Both comments and pings are currently closed.